We pride ourselves on the quality of our craftsmanship and professionalism. 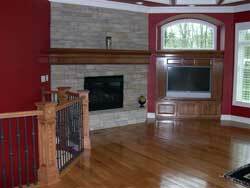 We provide unparalleled service for your remodeling needs, within a nice, neat working environment. Customized cabinetry makes a unique statement within your home. Whether it includes custom moldings and door styles, innovative storage solutions or an elegant special finish, details are what custom cabinets are all about. We work with you to custom design and build the cabinetry to meet your needs and vision. We have many references you can call. Since our work is based on recommendations, we complete your project on-time & on-budget!